Sheffield United Community Foundation offer high quality education provision. Formerly known as the Futsal and Education Scholarship, the Football Education Academy is now a more bespoke and unique opportunity for young people to continue their education in both further and higher education. Based solely at Sheffield United Football Club, learners will thrive in a professional learning environment where we offer high level teaching and learning, outstanding work experience opportunities and a very unique and stimulating enrichment programme where learners can represent Sheffield United Community Foundation in Futsal and Football against other clubs such as Leeds United, Huddersfield Town, Middlesbrough, Rotherham United and many more up and down the country. What you do and what you achieve at Sheffield United Foundation will hopefully have a positive impact on the rest of your life, so please make the most of the opportunities available. We will help you do that by providing you with passionate and excellent teaching, facilities and support. We’ll give you hands on experience that will make your CV stand out handle yourself when you start at work. It’s hard work, but you’ll enjoy it. And we’ll put in everything we’ve got to make sure you succeed. This is a 2 year full time course and offers you the opportunity to develop an understanding of the types of activities undertaken by sport professionals. The Level 2 Diploma in Sport is a specialist work related course built around the NCFE platform. The course is to build knowledge of practical sports performance, training and personal fitness, running sports events and sport community volunteering. The Level 5 Foundation Degree in Community Football Coaching and Development has been designed by the University of South Wales in conjunction with the Football League Trust. Not be in full time employment or education. A genuine interest in working with children in sport. At the start of the 2016-17 academic year. Our Sports Education Academy welcomed our first football team as part of the student enrichment programme. We currently compete in the very unique Northern Football League, where a select few football clubs are invited. Current teams in the league for the 2017-18 season are; Nottingham Forest, Notts County, Leeds United. Bradford City, Rotherham United, Huddersfield Town and Barnsley FC. Our football team trains once a week and plays their home fixtures at SUFC Academy. Our away fixtures have seen us play at prestigious venues such as Leeds United’s Thorp Arch and Oakwell. Our football teams will also have an exclusive opportunity to play at Bramall Lane at the end of the season. 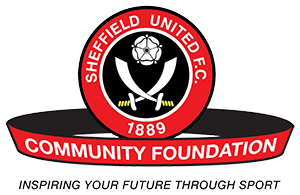 The Sheffield United Community Foundation education department specialise in the delivery of sports specific qualifications for 16-19 year olds with an interest in one of the various careers in the sports industry. Whilst studying with us, the students have a number of opportunities to develop their learning capacity and learn new skills for future employment. We encourage students to take advantage of volunteering opportunities with Sheffield United Community Foundation, delivering football and physical activities throughout the city. All educational lessons take place at prestigious SUFC facilities including the Study Centres at Bramall Lane and the Redtooth Academy. The Study Centre at Bramall Lane is a multifunctional IT suite with additional space for classroom activities. The Academy classroom is also equipped with IT facilities and breakout space for practical sports activities and is also home to the SUFC Academy scholars.